Russian Gulch State Park is one of the 70 California state parks slated for closure in July 2012. Those that have visited Russian Gulch know what a gem it is. Those that have not, should make plans to do so. Russian Gulch's hiking trails lead into a lush coniferous rain forest and converge at a 25 foot waterfall. The picnic areas are on coastal headlands affording whale watching and spectacular views of Mendocino and Point Cabrillo. The beach is an easy launch for abalone divers and kayakers. The sea kayaking around Russian Gulch is spectacular with mazes of rock gardens, sea caves, and tunnels for exploration and play. Tomorrow, the Department of Parks and Recreation will be voting whether to allow Russian Gulch (bundled with 3 other Mendocino County State Parks) be privatized (run by businesses or corporations). Our local non-profits are asking interested individuals to submit letters asking for the DPR to hold off on voting until all non-profits have had a chance to submit their proposals. Here is a link from the docent at Point Cabrillo with a sample letter. I am going to write in support of non-profits being given a chance to run the park. Our non-profit organizations on the Mendocino Coast have a history of preservation and good management of local resources. Mendocino Area Park Association (MAPA) is a nonprofit that supports educational programs at the parks. MAPA has submitted a preliminary proposal to take over operations of Russian Gulch. I am not an expert on the politics of such things but wanted to share what is happening. 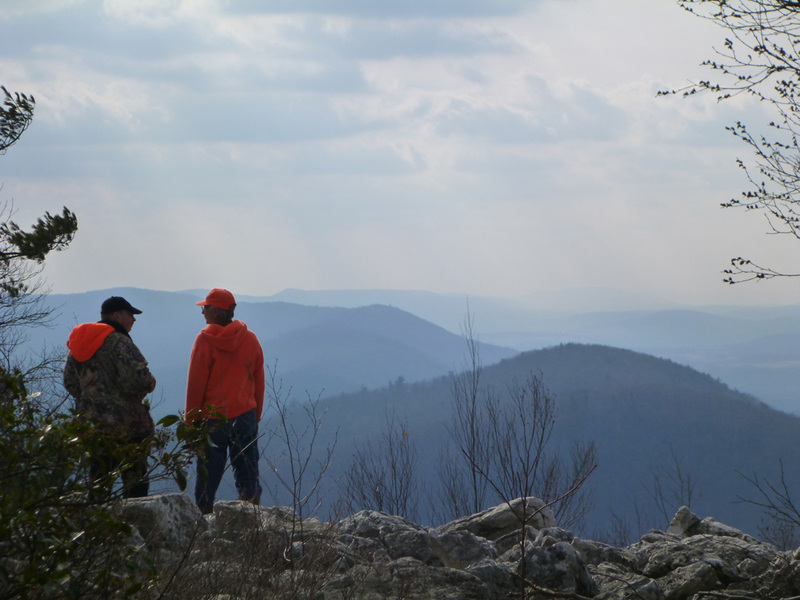 Perhaps those that are more versed could chime in to help get the word out how to save this gorgeous state park. It is raining buckets on the Mendocino Coast. I have a ton of rainy day projects lined-up and have been making some progress. Progress is limited though as I love a quiet, rainy day at home listening to the rain, reading, and day dreaming. Today it is quite windy. With the ground saturated from recent rains, it is likely that some trees will blow over and knock the power out. No problem for us. We are prepared with candles, battery powered radio, and camp stove. If my post isn't published today, it is because the power went out or because I just relaxed and enjoyed the rainy day. What I am a little fretful about is having to drive 1.5 hours to Ukiah for jury duty tomorrow. I recently signed up for a Twitter account. You can now follow me as Woman on Water. I am not looking forward to another time consuming social media platform but am enjoying many of the informative posts on twitter as well as networking with new "friends." This morning's noteworthy new discovery on Twitter was Badger Paddles. Please check them out. They are a small business in Ontario, Canada carving gorgeous wooden canoe paddles. I love their different shapes and of course think that their water color paddles are super cool. I am finding that Twitter is a good platform for me to tweet and retweet noteworthy businesses, websites, videos, photos, and information without overloading the Liquid Fusion Kayaking Facebook page. Yesterday, I was tempted to tweet the surf conditions as Jeff and I scouted for surf. However, I haven't connected my cell phone to Twitter yet and am still resisting being totally connected. Speaking of Facebook, I have started a Woman on Water Facebook Page. If you check out the page, you will see why I started it. I am not sure where I am going to go with the page. Feel free to "Like" it, share suggestions with me, and see how it evolves. As it rains, I find myself day dreaming of whitewater kayaking and connecting with my "foul-weather friends." We call our whitewater boating friends foul-weather friends because it takes rainy weather for our whitewater runs to flow and rarely do we get to enjoy a warm, sunny day of whitewater kayaking in Mendocino County. Believe it or not, there is a contingency of us foul-weather boaters. We obsessively monitor weather forecasting websites and of course Dreamflows for the river flows. The ocean has been very stormy with thunderous surf, frothing waves, rugged whitecaps, and channels of muddy waters streaming from flooded rivers and creeks. One can glance at local webcams like Caspar RV's beach cam or check out videos posted on YouTube. However, one of the best spots to check out the ocean is Todd's Point/Pomo Bluffs in Fort Bragg. I think it would be a great spot for a webcam; however, I would still walk or drive there to see it in person. It is noon and time to step away from the computer. A quick peak a the webcams and radar will help me determine my afternoon plans. Perhaps a kayak surf session or maybe a cozy afternoon of reading. I hope that your options for the afternoon are equally as promising. Of course, I had to indulge my "Goldilocks" tendencies and take the small one out for a test paddle - which actually ended up being more than one since I really enjoyed paddling it. If I had one word to describe the Dagger Alchemy, it would be FUN!!! Here is my review of the Dagger Alchemy - S (small). Overview: The Dagger Alchemy is a 14 foot touring kayak designed for touring on both for flat and moving water. It is designed to be stable and maneuverable and suitable for paddlers of all skill levels. It has become a popular rock gardening boat among the Bay Area Sea Kayakers and can be seen in action in several of the Neptune's Rangers' videos. Fit and ergonomics: The Alchemy is 14 feet long. I didn't weigh it, but it felt much lighter than most plastic sea kayaks. Its lighter weight and shorter length really made it nice to transport, store, and carry when compared to our other plastic sea kayaks which are in the 16 foot range. The first thing that I liked about the small Alchemy is that Jeff felt it was too tight of a fit for him (5' 11" and 150 pounds). He rarely feels that way about a boat and often gravitates toward smaller sized or low volume boats. On the other hand, most small sized boats are too big for me (5' 4" and 120 pounds). The outfitting was quite comfortable and fairly adjustable. This is important for an instructional kayak and also for me as a petite paddler with short legs. I was able to get good thigh contact with the adjustable thigh hooks and was happy that the foot braces had shorter adjustments than what I needed (meaning we could use this boat for very small paddlers and kids). As I moved the boat around and sat in it, I was starting to really like it. I liked the low deck and was starting to feel that this was a boat truly designed for a smaller paddler. My opinion changed when I went to put the spray deck on. The Alchemy has a large cockpit (similar in size to many whitewater kayaks). Putting the spray deck on was extremely difficult. There is a lot of space between the rear of the seat and the back of the cockpit combing making it very difficult to stretch and get the back of the spray deck on the combing. I have very good shoulder flexibility and putting this spray deck on was definitely tested it. After I got the spray deck on the back, I had a very long stretch to get it over the front of the cockpit combing. My fingertips don't reach that far so I had to scrunch up in my seat to get the deck on. It was very frustrating to have to do a contortion act to get ones spray deck on. This photo shows the large cockpit. 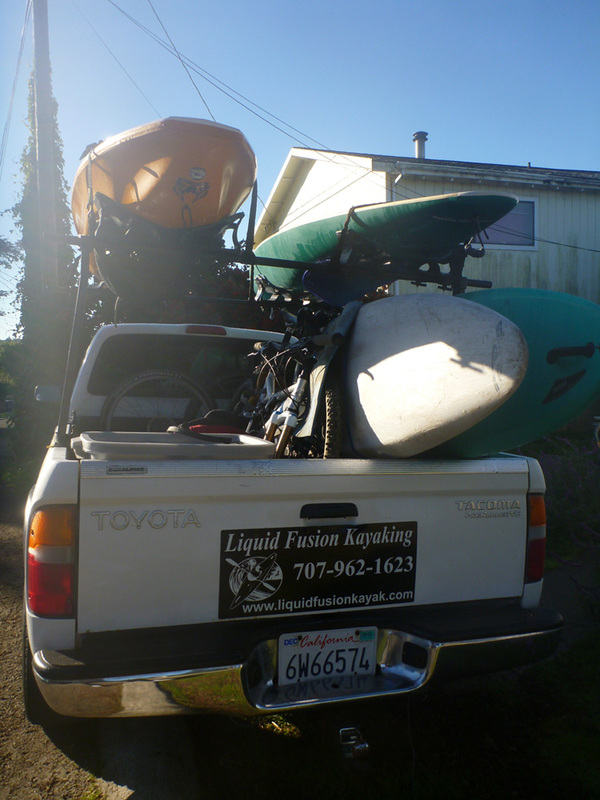 Performance: I paddled the Alchemy last fall on our typical Mendocino ocean kayaking adventures - rock gardening, surfing, and crabbing. My initial reaction was "Gee this is FUN!!!" 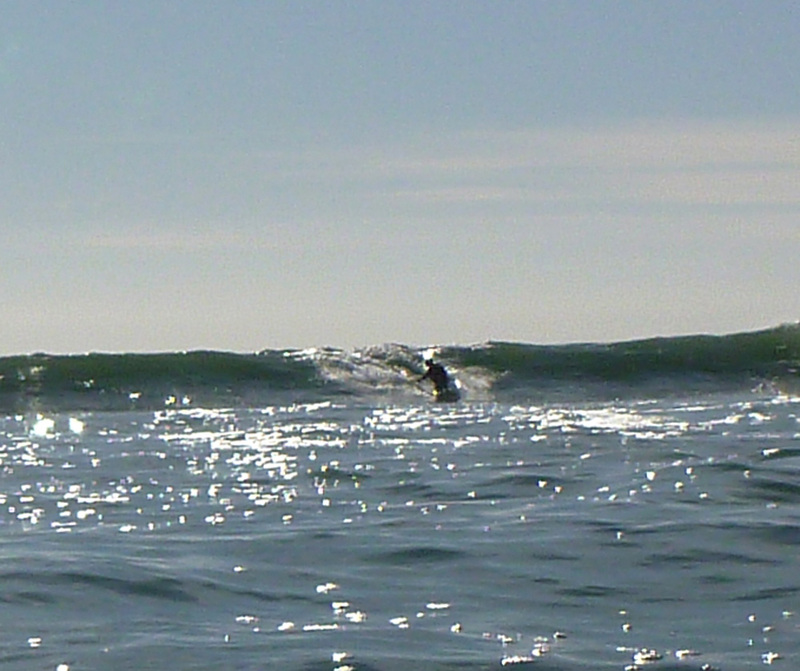 It is a lively boat in the swells and surf zone. It was very stable and wanted to be upright which is a good quality for beginning paddlers and those gaining confidence in moving water. This is particularly nice in the surf zone where many sea kayaks are a bit twitchy. When surfing it, I really had to work to get it to edge and felt that I needed to weigh another 20-30 pounds get it to carve. Of course, Jeff hopped in it in the surf and got it to edge and carve (Jeff weighs more but is also a VERY skilled paddler). I worked at it and eventually carved a few nice turns. When capsized, I was pleasantly surprised at how easy the Alchemy was to roll up. I could effortlessly hand roll it. I also discovered that the Alchemy is a great kayak for kayak crabbing. I was especially pleased that I could carry two of our non-collapsing pots on it due to the flat front deck. Hull speed is an issue that I had with the Alchemy. I expected that it would be slower than a 16 foot sea kayak, but it was a lot slower. I found myself paddling harder than usual to keep up on flat water stretches and was dismayed at my lack of speed and ineffectiveness in a towing situation. It didn't have the speed that I was looking for when paddling out through the surf nor the speed that I needed to catch waves. I adapted and positioned myself on the waves and pour-overs like I would in my whitewater kayak. For playing, the speed issue is something that I would adapt to. However when guiding or doing more extreme paddling when speed is necessary and others are depending upon me, this could be an issue. Bottomline: The Dagger Alchemy is a fun kayak! I would recommend it to beginning and intermediate paddlers who are looking for a playful plastic sea kayak. It's lightweight and shorter length make it convenient for transport and storage. It is comfortable with adjustable outfitting, and its stability is confidence inspiring for surf zone and rock garden play. I also think that the Alchemy would be a good choice for beginners who are leaning toward purchasing a recreational kayak but want a boat that is seaworthy. For me - We have one, and I will play with it as it is lightweight, easy to transport, comfortable and fun. However, it won't be my primary sea kayak for rock gardening due to its lack of speed and difficulty of the spray deck. I have to be able to put a spray deck on quickly and easily unassisted in all conditions (perhaps I should have Jeff video me contorting to put the spray deck on to demonstrate my point). If Dagger fixes the cockpit issue, I would probably revisit it as my sea kayak rock gardening boat. If you've paddled the Alchemy or have questions or thoughts on it, feel free to comment below. If you are considering buying one, take one out for a test paddle. A black screen with information about Stop Internet Piracy Act (SOPA) an Protect IP Act (PIPA) are on many websites today to create awareness of the latest attempts of corporate America to control the internet. Take a look at craigslist today. Internet piracy is a huge issue. I have had my photos and content stolen which is flattering but maddening. (why I started putting the gaudy watermarks on my photos). Internet piracy is a huge issue that goes beyond someone using my photos. It is financially detrimental to some companies, but we need to make sure that measures to control piracy don't become censorship. At first SOPA and PIPA seem benign and good steps toward stopping piracy on the net; however, they go too far. Imagine the internet without wikipedia, craigslist, google, youtube, blogs . . . . where the government (under the influence of corporate America) takes control of the web. Many websites have gone to black screens today and will have information and easy action steps to take to protest SOPA and PIPA. Please take a few moments to become educated and to act accordingly. Here's a video from vimeo that I found helpful. If you like it, please share it. If you have other sources of information, please share them by commenting below. Just before Christmas we packed up our bags to spend the holiday season with our families – a couple of days with Jeff’s family in San Jose and a couple of weeks with my family in Central Pennsylvania. 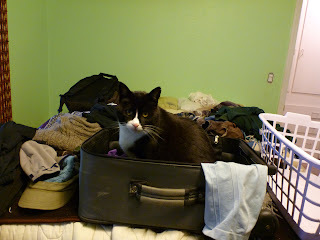 Tom Cat was not happy about our travel plans and thought that he might try stowing away in my suitcase. We debated shipping our drysuits to Pennsylvania to do some canoeing but figured that the weather would be too cold to even think of paddling and decided to take a 2 week break from paddling. 2 weeks is the longest time that I have not been on the water since the summer of 2008. Physically – it felt great and was a nice break. The weather in Pennsylvania was unbelievably mild. 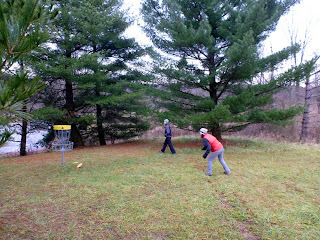 I was a little bummed not to have snow for sledding but enjoyed lots of time in the outdoors. 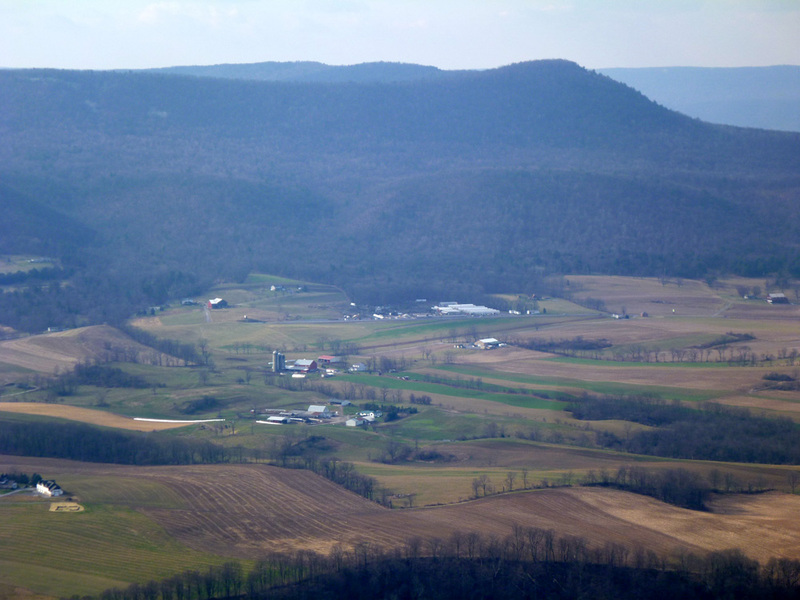 My family’s dairy farm is nestled in a valley of rolling hills surrounded by the Allegheny Mountains. It was nice to spend time with my family and enjoy the familiar sights, sounds, and tastes (not the smell) of home. I reminisced of my childhood and teenage years – milking cows, tending to the sheep and calves, and working in the fields. Any trip off the farm though had me looking at the rivers and dreaming of paddling them again. One day, we hiked at Trough Creek State Park and eyed a couple of slots and wave trains on the creek as my brother told of his adventure kayaking it after Hurricane Irene. Another day we saw a bunch of boaters taking out at my favorite fishing hole on the Little Juniata River and I longed to have been with them. 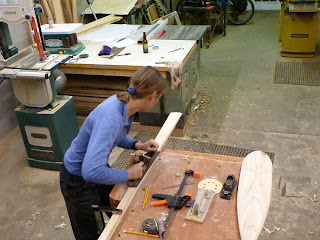 The only time that we had our hands on paddles was as we carved a few in my brother’s workshop. We had hoped that California was having a normal weather year and the rivers would be flowing so that we could go whitewater kayaking when we returned. Unfortunately, there has been no rain (or snow) in California. It is scary how dry things are and how low the rivers are. We can’t control the weather and fortunately had packed the “Fun Truck” full of our favorite toys so we headed to the coast for some kayak surfing. “Absence makes the heart grow fonder.” During my 2 weeks in PA, I didn’t look at the marine forecasts, swell predictions, or buoy reports. It was strange to be away from the pulse of the ocean. When I returned to California, I realized how much the ocean has become a part of my soul. As we paddled out, I relished the familiar sights and feeling of the California Coast. As the swells rolled under my kayak, I marveled at the size of the common loon that was casually rising and falling with the swells and enjoyed the bobbing and diving of the eared grebes. I soaked in the sun’s warmth as it reflected off the water as did the pelagic cormorants perched on the rocky cliffs. 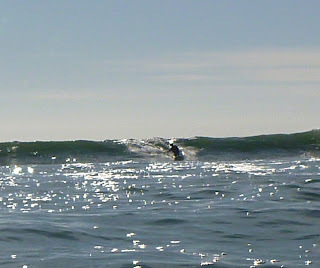 But the best feeling was surfing my first waves of 2012 and being back on the water.